I keep telling you I am quitting, and I am not. Today, September 6th, ten years ago, I was sitting in my aerie in Kuwait, overlooking the Arabian Gulf, when I gathered all my nerve and went public. I’d always wanted to write. What better time? While every move was a great adventure, there was a downside. The downside is that it takes a while to gather your “band of brothers” (mine tend to be mostly sisters), your buddies, your protection against the inevitable rudeness of life. I was still reeling from leaving the strong band we had formed in Qatar (and still we are in touch, celebrating and protecting one another), and I was not yet sure where my Kuwait friends would come from. I was in for a big surprise. I met wonderful friends through blogging. To the best of my knowledge, I am the last one standing of my blogging friends at that time; they were crucial to my investment in Kuwait, and the returns on that investment. I learned from them, I changed a lot of my thinking due to new ideas they introduced, and I profited greatly from our relationships. The friendships I formed in Kuwait rocked my world. I was so scared, at the beginning, putting myself and my ideas out there. I loved the feedback I got, and get. I wanted a place to tell my stories so I wouldn’t forget them, and to ponder things I still don’t understand well. Your feedback and input are a great gift to me. I still love sharing our trips with you, and, from time to time, puzzlements from my own culture. I’m still that little girl from Juneau, Alaska, a stranger in a strange land. Thank you for a wonderful ten years. No, I am not planning to stop. I’ve had to be more patient with myself. Expat lives have spaces in them, time is different outside the United States, less full-all-the-time. I can’t blog the way I used to. I can’t quilt the way I used to. My time is full with AdventureMan, and grandchildren, and family, and church, and volunteer experiences. We have a wonderful life, and we still get restless. We take two large trips a year now, to satisfy that wanderlust, and smaller trips to Mobile for Syrian food, to New Orleans for the escape and for Ethiopian food, to Atlanta to see friends, to Seattle to see family – and for Chinese food, to Panama City and Apalachicola for family and oysters. LOL, yes, there is a pattern. And meanwhile, we are surrounded by some of the best Gulf seafoods, and some of the best BBQ in the world, but man cannot live on BBQ alone. Thank you for hanging in there for all these years, and for all the fun we’ve had together. Thank you for helping me learn about and understand the nuances, the deep underbellies of the cultures I otherwise would have skimmed over, never knowing the depth and richness I was missing out on. Thank you for your friendships, and for all the stories you have shared with me in the background that helped me see things differently. It’s you who have rocked my world, with your honesty and your bravery. And while you are here, have some mint tea – yes, the mint is from our garden – and cake. Those Venetian ones are soaked in liqueurs, but there are some chocolate ones, and a gingered fruit or two . . . You are always welcome. “Why would you want it?” by boss asked, as I rescued a box from the recycle station and asked if she minded if I take it home. Old habits die hard. This was such a perfect box! It has no markings. It has no dents. It’s a strong box; you could mail books in it, or carefully wrapped things you want to arrive in one piece. You could mail things to Doha or Kuwait or . . . oh wait. I don’t do a lot of mailing any more. Old habits are hard to break. I’ve been on the watch for good boxes most of my life – through college, through my early married years in Germany, through all the years of mailing Christmas presents, through all the years of scouring for good cardboard boxes in Tunis, Amman, Riyadh, Doha and Kuwait. Even though I rarely mail a box these days, I still have a hard time passing by a really good box. I am learning to resist . .
VATICAN CITY (AP) — The Vatican will shelter two families of refugees who are “fleeing death” from war or hunger, Pope Francis announced Sunday as he called on Catholic parishes, convents and monasteries across Europe to do the same. Francis cited Mother Teresa, the European-born nun who cared for the poorest in India, in making his appeal in remarks to pilgrims and tourists in St. Peter’s Square. “Faced with the tragedy of tens of thousands of refugees who are fleeing death by war and by hunger, and who are on a path toward a hope for life, the Gospel calls us to be neighbors to the smallest and most abandoned, to give them concrete hope,” Francis said. It’s not enough to say “Have courage, hang in there,” he added. In Pensacola, we have several top level Syrian doctors. Syria has been a crossroads of civilization for longer than the United States has been in existence. We can benefit by welcoming the Syrians and the Iraqis and the Afghanis into our own communities. One of the things that adds texture to my life, and helps keep me on the straight and narrow (and that takes a LOT) is reading the daily lectionary every single morning of the year, before I do anything else. Normal days, I access it from my computer, traveling or appointment days, I can access it from my iPad or iPhone. It’s like a little extra fence that helps keep me safe from myself and my own creativity when it comes to evil. There is another side, the blessing side. In one of the bible studies I attend, we learn, over and over that God blesses the believer. You don’t have to be perfect – and it’s a good thing, because none of us are. If you want to see how much God can love a sinner, just read your bible. Sin is one of the main characters, right along side Abraham and Sarah, Job, Lot, and especially King David. But in my life, I have seen wondrous things, and I have had some totally WOW moments when God has blessed me beyond any prayer I could have raised. One of those moments was showering under a waterfall near an oasis in the Tunisian desert. Two others happened this year, and these were blessings that stopped me in my tracks with their timing and aptness. First, we got an unexpected tax refund which arrived in our account just in time to cover the big expensive air conditioning system on the main floor when it broke and had to be replaced. Second, when we were looking for the last few thousand dollars to help us buy a new car (we prefer to pay cash) we got another tax refund – we had asked that they re-look taxes for a move, and they allowed the moving expenses. We had waited almost a year for that decision; we had waited so long we had pretty much forgotten and given up on it. I mean tax refunds – it’s a never-never land, it all seems so arbitrary. You can have a perfect case, and it can be denied for a reason you’ve never heard of. God’s timing is perfect. His sense of humor is breath-taking. The funds we needed poured into our hands just when we needed them, in just the right amount. 25 ‘Therefore I tell you, do not worry about your life, what you will eat or what you will drink,* or about your body, what you will wear. Is not life more than food, and the body more than clothing? 26Look at the birds of the air; they neither sow nor reap nor gather into barns, and yet your heavenly Father feeds them. Are you not of more value than they? 27And can any of you by worrying add a single hour to your span of life? * 28And why do you worry about clothing? Consider the lilies of the field, how they grow; they neither toil nor spin, 29yet I tell you, even Solomon in all his glory was not clothed like one of these. 30But if God so clothes the grass of the field, which is alive today and tomorrow is thrown into the oven, will he not much more clothe you—you of little faith? 31Therefore do not worry, saying, “What will we eat?” or “What will we drink?” or “What will we wear?” 32For it is the Gentiles who strive for all these things; and indeed your heavenly Father knows that you need all these things. 33But strive first for the kingdom of God* and his* righteousness, and all these things will be given to you as well. 67,000 is a staggering number. I would be interested in seeing a breakdown of the extraditions by nationality and occupation. Following its recent crackdown on undocumented migrants, Kuwait has revealed important information regarding the numbers of migrants who have left the country or were deported during the year of 2012. According to a statement from the ministry of social affairs, 67 thousand migrants lost their residencies in Kuwait last year. 28232 of them were deported, 38 thousand of those who left the country and did not return for over a year, and 739 of migrants who passed away. Since April, at least 2000 migrants were deported from the country for traffic violations. The ministry of interior affairs thought this policy will help reduce traffic. Many migrants were advised by their embassies to stay at home. Recently, a decision was made to deport migrants after committing their first major traffic violation. The ministry stated that they were able to collect 9 million KWD in 40 days during the months of May and June as Kuwaitis and migrants lined up to pay their traffic tickets. 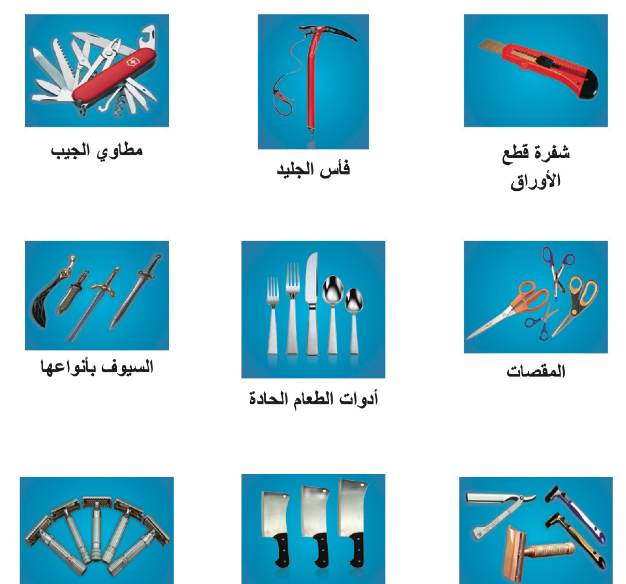 LOL, the have you been to the web page of all the items that are banned for traveling in and out of Kuwait? It’s all in Arabic, but you can understand the photos. My last move to Kuwait, I was allowed several hundred pounds to take on the airplane. I packed an entire set of flatware, and all my good kitchen knives, and lots of scissors. . . like, who can live without scissors??? Honest Judge, so sorry, I had NO idea! No one asked me if I was carrying dangerous flatware in my baggage! You can see all the photos of prohibited items here. Just after getting married to Meena, architect Ken jumped at the chance to help design Doha’s new international airport. So, they’re trading in the golden state of California for the golden lands of Qatar. But as these newlyweds discover each other, the new city of Doha is also discovering its own identity as it moves towards the future. From sleek new development to traditional neighborhoods, real estate agent Ana Figueiredo will help them navigate Doha’s changing landscape. Watch as House Hunters International uncovers all that glitters in Doha, Qatar. I checked YouTube; the episode is not yet up. It was so much fun, seeing this young couple in the Souks, down near Al Saad in Mirqab, and out at the Pearl. The apartment they settled on was in Al Ashmak, near the Corniche; I think it was one of the Bilal apartment buildings. We’ve been in Pensacola three years this month, or anyway, I have. AdventureMan retired, but went back twice to help out and to start things up on a major contract. He was retired, but useful. The longest we’ve ever stayed in any one place was 6 years. The second longest was 4.5 years. There were some 6 month places, 10 month places, and three years was a long posting. I feel the internal clock ticking; I am cleaning out closets and drawers. No, I am not packing. No, I am not moving, but the habits are still there and don’t go away. Go through everything. Weed and cull. Pass along. Give away. Evaluate. AdventureMan is fully engaged in a very different life from before, and it requires some adjustment – for both of us. You’d think my life wouldn’t be that different, I still do aqua aerobics, I spend time doing volunteer work, serving the church, meeting up with other quilters, etc., same life, different location, right? No No Noooooooooooooooooooo! Take the spice drawers. AdventureMan still tells the story of when we first got married and I did my first big grocery shopping, setting up household. As he lugged bags and bags into the house, he jokingly asked if I had everything (his bachelor refrigerator kept beer cold; there was nothing else in it!) and I said no, that I had groceries, but I would have to go back for spices. When I got back with two bags full of herbs and spices and cooking things like baking powder and baking soda, he was wide-eyed. He was thinking “salt . .. pepper . . . what else is there?” He still laughs about it, lo, these forty years later. 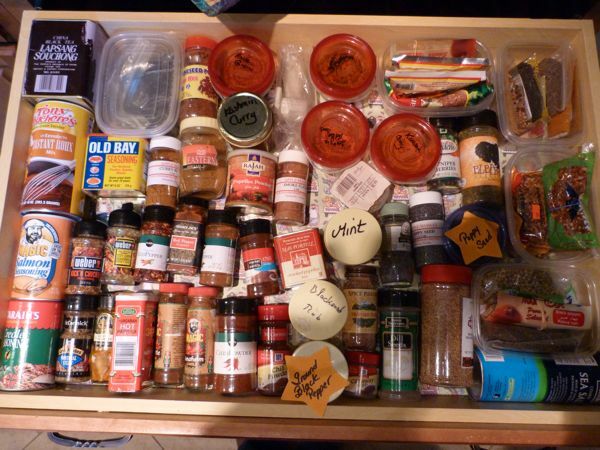 Three years in Pensacola has given me time to think about the spice drawers. They frustrated AdventureMan, and he offered to re-arrange them more logically, which almost started a nuclear war in our family dynamics. Logically, he is now doing more cooking and he should have more input, but it is really, really hard for me to give up territory in the kitchen, and, well, AdventureMan can be a little bit aggressive in amassing his territory. 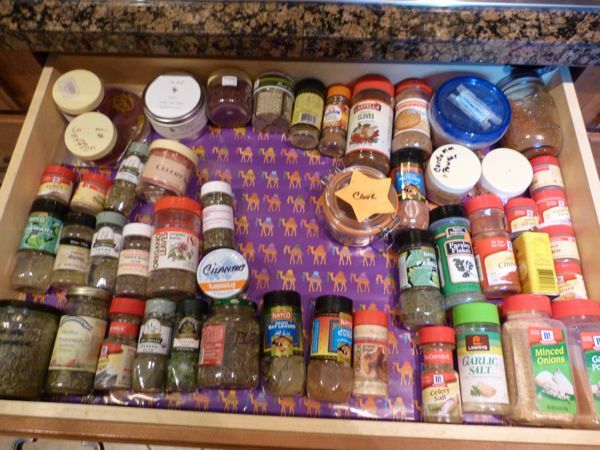 But, after three years, I agree, the spice drawers are not working, and one reason is I got this state-of-the-art rubberized drawer liner, but it crept back and made the spices rise up and then the drawers got stuck open or closed and it really was frustrating. Yesterday, I had the house to myself and because I hadn’t planned it, it wasn’t something I dreaded, I just started fiddling with the spice drawers, just editing, getting rid of some really old stuff, combining duplicates and . . . well, because I hadn’t put it on the “To Do List” it was fun. So much fun I decided to go all the way, take out the annoying rubberized liner and have some fun. I’ve always loved great drawer liners. Good thing, huh? I’ve lined a LOT of drawers. 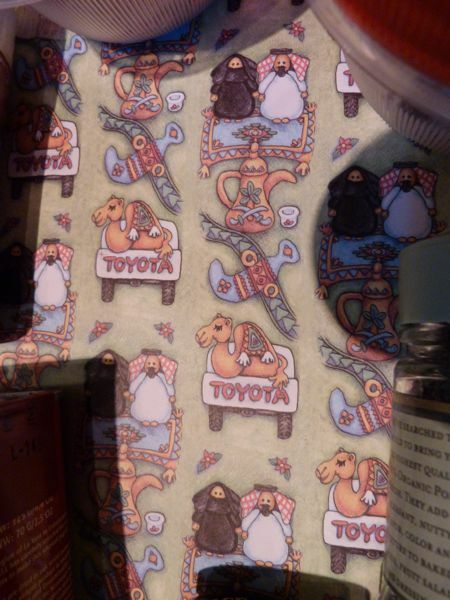 There are some wonderful liners out there, but I love to use wrapping paper. Every now and then I’ll see a design I love, or something that thrills my heart. Because I moved so often, I knew it wasn’t a lifetime commitment, so I just had fun with it. And that is what I did yesterday. I have some great wrapping paper I brought back that I went to a lot of trouble to get, flying down from Kuwait to Doha to go to the American Women’s Bazaar in November, where I knew there would be the vendor from Saudi Arabia who makes and sells these quirky, whimsical Arabic-themed wrapping papers that I loved to use for all the Christmas gifts and house-guest gifts I would take back three or four times a year. I hand carried several rolls of this paper back to Kuwait, then shipped it back to Doha when we moved back there, then shipped it again, carefully protected, to Pensacola when we retired. Here in Pensacola, however, it seems less and less relevant. I don’t use it to wrap my Christmas gifts like I used to because the gifts are no longer exotic surprises from the Middle East. And I still have a lot of this paper, paper which delights me, but for which I have no real purpose . . . So I decided I would use it to line my spice drawers. I can see it every day and smile. It is making itself useful, and two or three years down the road when it is worn and needs replacing, I can find something else that delights my heart. When AdventureMan comes in, I am just finishing up. I warn him, because he, like me, likes to know where things are.